Dimmig picked up a cool $1,319,587 for the win. 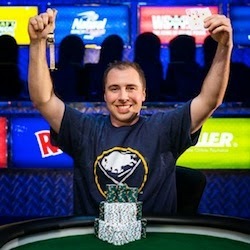 According to Hendon Mob his biggest previous cash was for $11,106 for finishing third in a WSOP Circuit event in San Diego. A decent boost to the career total, that. The “Millionaire Maker” comes with a guaranteed first prize of $1,000,000, which clearly is a huge draw for players. Positioning the event early in the schedule rather than later (as was done a year ago) probably helps, too. The format was introduced last year, drawing a 6,343-entry field topped by Benny Chen who won $1,199,104. They’re also experimenting this year with a guaranteed first-place prize in the Main Event -- $10 million, a figure ostensibly chosen because (1) it is higher than what recent Main Event first prizes have been (to make it the same or lower would make it less of a draw), and (2) because the number resonates with this being the 10th year the WSOP is being held at the Rio All-Suite Hotel and Casino. The turnouts for both “Millionaire Maker” events have well exceeded what is needed for the typically-used payout schedule to award at least seven figures to the winner. In other words, no adjustments have been required that would take money away from other cashing spots to meet that $1 million guarantee for first. That means there is going to be something like $1-$1.5 million of the prize pool taken away from those finishing 2nd through 700th (or whatever) and given to the winner. Very nice for the champ, but less so for everyone else.